Apple today said third-party developers can now access Siri and add Siri to their own applications. This means iPhone and iPad owners will be able to ask Siri to perform a much wider range of actions. 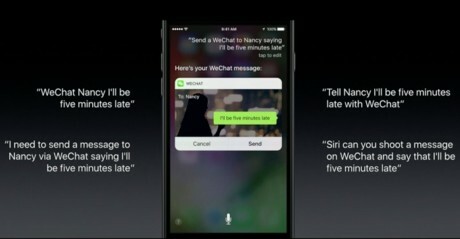 For example, WeChat has added Siri and users will be able to say, "Hey Siri, send a WeChat messages to Mom." Some of the apps prepared to add Siri include Snapchat, Shutterfly, Internet, MapMyRun, RunKeeper, Runtastic, AliPay, SquareCash, Vonage, Skype, and many others. Apple didn't provide specifics about the APIs involved, but Siri can handle followup questions and understand a conversation thread better than before. All of Siri's new features will be available to iOS and MacOS devices, as well as through CarPlay, later this year.